rub ingredients in a small bowl. Open the salmon flat and massage it well with about 2/3 of the rub, reserving the rest of the mixture. Fold the salmon back into its original shape, place it in a plastic bag, and refrigerate it overnight. temperature to 180' to 200' F.
sit at room temperature for 30 minutes. rub together with the other mop ingredients in a small saucepan and warm the mixture over low heat. placing the fish as far from the fire as possible. Cook for 50 to 60 minutes, mopping it after 10 and 30 minutes in a wood-burning pit, or as appropriate for your style of smoker. The salmon should flake easily when done. 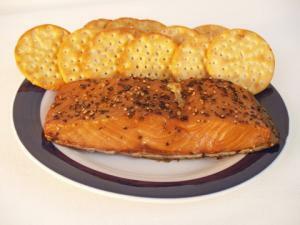 Have a large spatula and a platter ready when taking the salmon off the smoker, because it can fall apart easily. BBQ Tips: Alder remains the best wood for smoking Pacific salmon. Alder chips are fairly common across the country, but you may have more difficulty finding the wood in chunks or logs. Fruit woods are the best substitute, particularly when mixed with smaller pieces of alder.